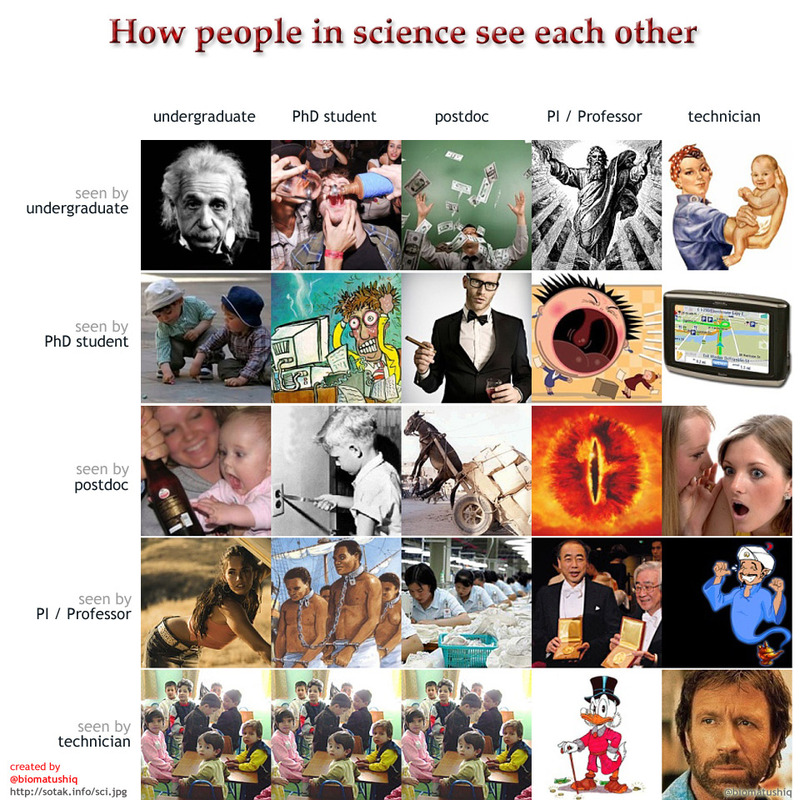 Exactly 1 year and 1 day ago I made up a little satiric, but mostly funny infographic of how people in science see each other. I did not expect so huge response. I want to share with you, how small funny thing can cause quite big impact and all thanks to social media. It all started with the first tweet. Immediately I got a few retweets and RTs of RTs. All in the waves with increased intensity when some influencers had retweeted. It seemed that everyone from academia who saw the picture felt an urge to post it further. In a few days it started to appear at blogs of science bloggers and other sharing sites. After that I wrote the blog with the story of the picture. All of that sharing increased traffic of my personal page (as I mentioned it directly at infographic) extremely. The most powerful moment was RT from @NatureNews, what had great impact and spreading. Only at Twitpic where it was firstly published, till now it earned almost 400,000 views, 2,600 twitter mentions and 27,000 Facebook likes. In my humble view, incredible! However, it did not end by online impact. I was told from many sources that this picture was hanging in labs around the world. Some of my old friends, who were recently working abroad wrote me if it was me who had created that picture hanging in their lab laughing at it. As result, finally I hung it also in our lab. Once I got a phone call if it can be used at conference talk for postdocs and few permission request for reprint in info bulletins of some societies or PhD newsletters. Sometimes I think, that I should include it to my PhD thesis, as it had rather bigger impact that papers I have published, however I am not sure about opinion of committee Moreover, I was retweeted by Nature. What else is dream of young scientist? Hm.. maybe Science. And that is the next story of how I got published by Science also via Twitter help. I found there announcement of Science survey of young scientist called NextGen Voices. Task was simple. To answer what is definition of successful scientist and how it changed from times of my mentor. I just answered with short sentence, that nothing changed and still is actual what my PI claims. That the successful scientist is the one whose name in books moved from “name index” to “subject index.” I was really excited when I got letter from editor with request of photo. To be in printed in Science is not everyday experience for young scientist from Central Europe. So, I have made it to Nature as well as to Science. All with the help of new social media. Maybe scientist should be more encouraged to use it. It can be useful and one can be different. Should my career end here? Not really. One ‘simpler’ task ahead. Finish my thesis. Wish me luck. It seems this time it should be rather without social media. If you spare some time in academia and science process, you see how your seeing of others and yourself changes in time. Sometimes it is good to have a sight from different angle. I passed some different positions and I imagine how could feel others. But mainly enjoy, have fun and spot on! I like to thank @kejames, who tweeted, she would have liked to see something like this, but for science. And thank to all wildly mentioning it on twitter. Firstly it appeared on twitpic and started with this tweet. However it have had so huge feedback, I made it blog too Feel free to spread pic on your blogs, labs or colleges and if you do not mind reffer to this blog post. As some of you wanted to print it, the highest resolution and quality image is available.